Restaurateur Larry Mindel and Chef Peter McNee will be opening Convivo restaurant and bar this spring at the newly remodeled Santa Barbara Inn, 901 East Cabrillo Boulevard. Convivo, whose name means ‘to come together’ and is the root word for the Latin term for ‘feast.’ McNee describes his style of food for Convivo as ‘Nomad Italian.’ “The foundation – our soul – is Italian but our destination is Santa Barbara and the menu draws from different styles and traditions along the way,” said McNee. His menu will feature cicchetti (small plates served in bite size portions), shareable antipasti, house-made pasta, wood-fired pizza and a bounty of seafood and meats roasted over a wood fire. Many dishes are served family-style and everything can be shared. “Great meals are ones shared with friends and family. Conviviality is a central theme of the restaurant and the seasonally changing menu,” said McNee. 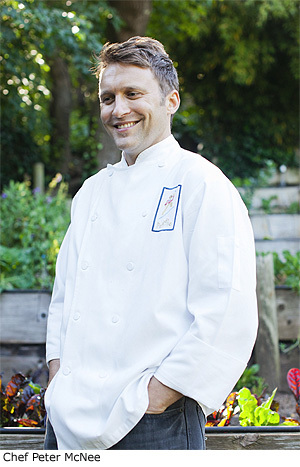 After graduating college, McNee left his home state of Minnesota for California to pursue a career as a chef in San Francisco. While attending culinary school he worked at famed Stars and later at Tra Vigne in Napa Valley. Not satisfied with his stateside teachings, Peter embarked on a yearlong culinary pilgrimage to Italy to cook with the ‘nonna.’ While living with host families, cooking and traveling throughout the country, he fell in love with Italian food and culture. Returning to the Bay Area, he was drawn to iconic restaurateur Larry Mindel, the founder of Il Fornaio restaurants, and his shared passion for Italy. As Executive Chef at Poggio, McNee and owner Mindel formed a lasting friendship and partnership. The restaurant has earned multiple 3-star reviews from the San Francisco Chronicle and placement within the coveted “Top 100 Restaurants in the Bay Area” rankings each year since 2008. Poggio recently was included in the 2016 Michelin Bib Gourmand list for the San Francisco bay area. How can someone contact them regarding banquet services for future event? I’m an event coordinator for Larry Mindel’s Sausalito restaurants, Poggio Trattoria and Copita. For banquet or other event inquiries please email me at haleigh.poggio@gmail.com or call the Convivo office at 415-324-7099 for more information. Larry Mindel’s reputation for quality, style & intelligent choices make him a legend in the hospitality world and not another flash & distract hospitality group coming to town. We are fortunate they see long term potential for the Santa Barbara Inn. Chef McNee’s biggest challenge will be finding enthusiastic hard working loyal kitchen folks to support the project – he has the pro chops and experience to bring something really fine to Cabrillo Blvd. Rachel B you are right to book that banquet right away! Thank you! I have a very special professional interest in this restaurant, Mr. Mindel, Chef McNee and Mr. Gunner. Hoping my intuition is correct!